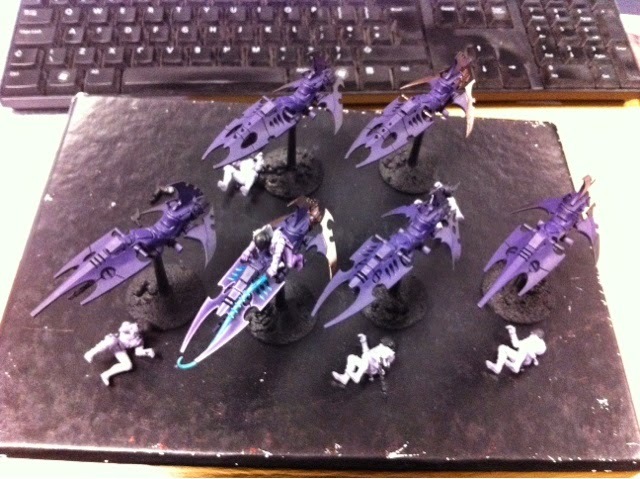 Hi all, got a brief battle report for you today, when I faced a proxied 1500pt necron army on Thursday using an experimental elite list from my Iron Fists. 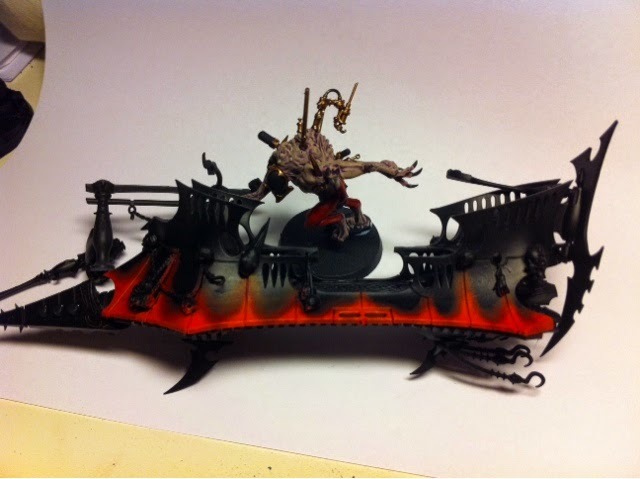 Wow, almost half way through this project, and well over half way through the work required for it, so I'll be adding bonus bits to the end of it once the main list is painted. 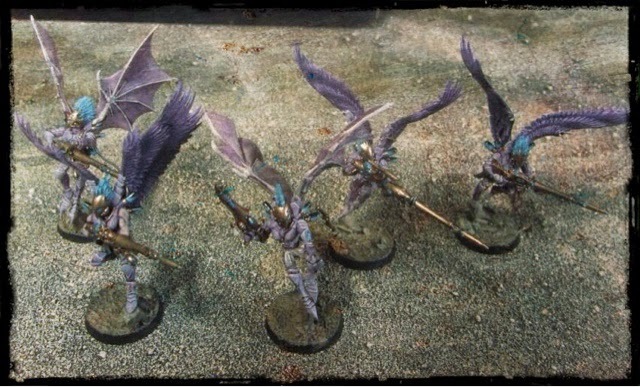 Still, over the last week I've made substantial progress now the ravagers are out of the way (though I have to admit, I've been butterflying a bit between units!). 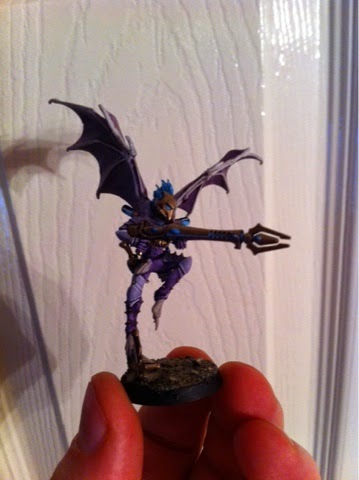 Scourges - these have been my main focus and are now complete! Warriors - I had intended to not touch these until next month but felt the urge to do something that constituted obvious visible progress so I basecoated and washed all twenty. I have another ten at home but they don't form part of my blogwars list. Hi all, Monday again? That must mean it's time for me to post up some more pictures then! 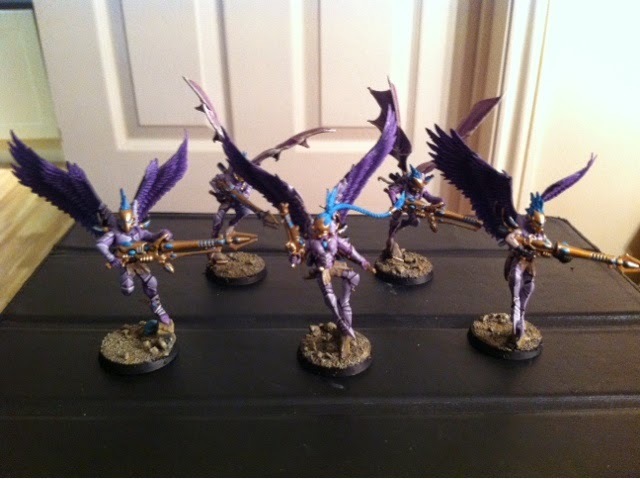 For those of you who've been following me for the past couple of months, 11 weeks ago I started on the path to create a 1850pt dark eldar force in time for blogwars 9, a tournament I'm attending in June this year. That meant a pretty strict painting regime for me, which is something I've not historically been very good at, being very much a painting butterfly. It's been working for me though, and I'm pleased to report that progress has been good so far, as I'm more than 60% of the way there (62% finished, to be exact!). 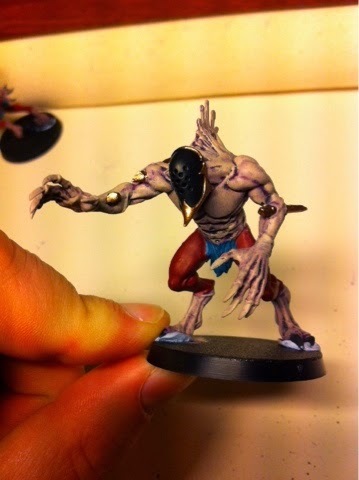 I've really struggled this past week though, motivation just wasn't there to finish my ravagers, thanks to the sheer amount of fiddly bits there are to paint. Still, a couple of stubborn evenings saw them finished last night, and here are the results (I'm pleased to say that the result made the effort worthwhile!). 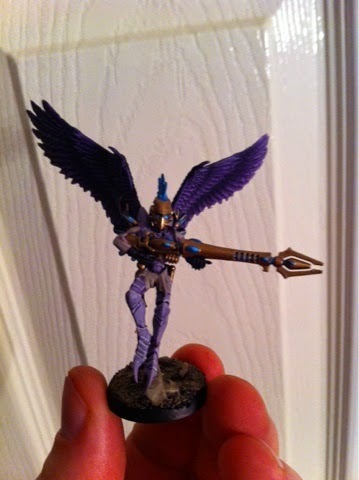 This is my coven raider, the scheme an experiment to see if it worked with the rest of my coven force. It does! Till next time, keep those brushes working overtime! Kabal of the Burning Eye and Iron Fists vs Iyanden - 2 reports for 1! 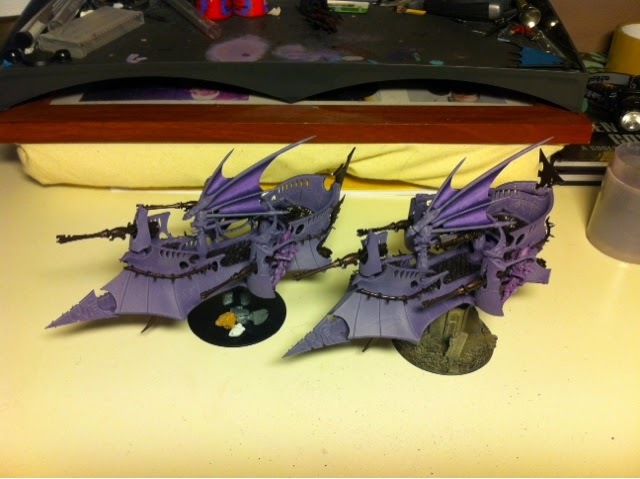 Morning all, I have two reports for you today, a campaign game featuring the Iron Fists at 1000pts, taking on Martin's Iyanden Eldar, and then immediately following that, my Dark Eldar also took on their dead cousins as my Kabal of the Burning Eye played at 1850pts. What progress have I made on my terrain this week? Quite a bit actually! When I left you last week, I had sprayed a stone spray onto the ruined buildings (and some non ruined ones) I bought from Amera plastic mouldings. This week, I've started painting a few of those pieces, ready to be attached to the modular boards I'm going to be constructing. Blimey, Monday comes round quick doesn't it! 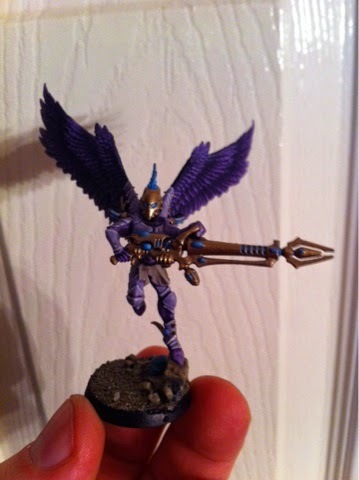 So after last week, I've had a bit of a quiet painting week. A couple of early nights means that progress hasn't been quite so hefty as I'd like. 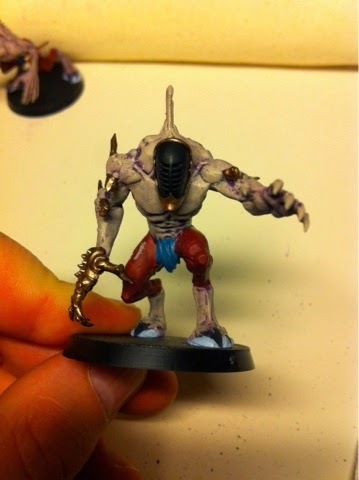 I'll be doing some more tonight, but for now you'll have to make do with an update on my Ravagers. I've been concentrating on the filigree elements so far, and just to prove I'm not pulling the wool over your eyes, here's the pic from the other side! So all the filigree work is done, now I need to put on the web design and get cracking on the crew. I'm pretty pleased with it all things considered (by which i mean it wasn't expensive, and after spraying it with stone spray, and washing it with vallejo black wash, I spent about 20 minutes drybrushing it). I'll give it a spray with some varnish once the weather warms up a bit, but for now I'm calling it done. 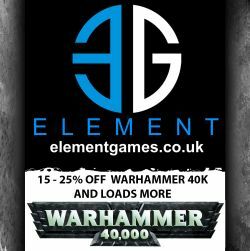 Hi all, I'm starting a new series with this post - how to improve as a 40k player. Posts won't necessarily be regular but you'll be able to find them all using the labels system on the left hand side of the blog. First, don't be put off, I'm not going to come across as arrogant, pretending to know all the answers (at least I hope I won't!). What I can promise you though is that everything I'm going to include is going to have been learned the hard way. First, a bit of background. 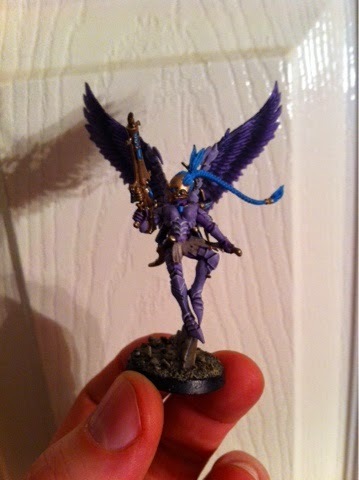 I first started off in this hobby over 20 years ago at the tender impressionable age of 14. I'd previously put together and painted many airfix kits, but once painted like many I suspect, all interaction with them was limited to hanging them from my bedroom ceiling and hoping they didn't crash land on me in the night. 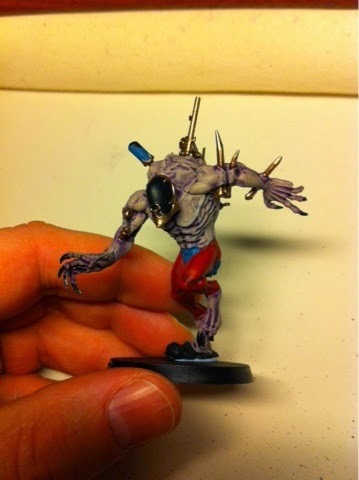 That changed when I discovered Warhammer though, and I started a skaven army. That love quickly spread when I read about the second war for Armageddon and I began collecting blood angels. Without going into too much detail, my gaming life stagnated once I left uni and moved back home - I live in a very rural area with no FLGS and an hour drive to the nearest GW, no one I knew played anymore. Still, I kept reading white dwarf and painting models, which in my naïveté I thought meant I knew what I was talking about. 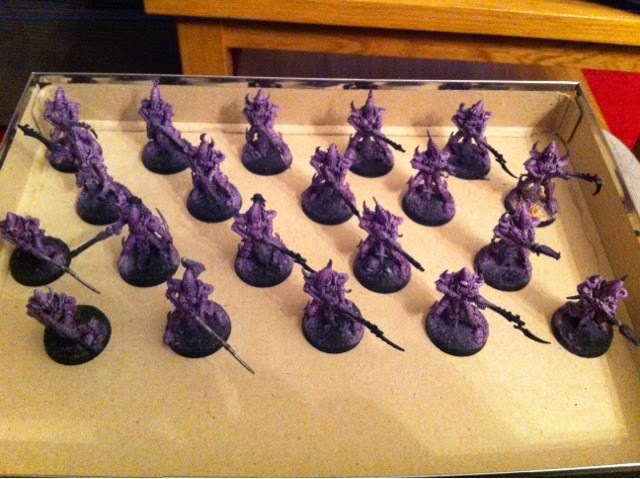 Autumn 2012 arrived and I found a club only 20mins away, so I packed up my cobra guard marines and trundled down to play. My first game ended with me having only 3 models left on the table. A four month losing streak finally ended and I've gradually improved since then, to the point now where I can comfortably say I win the majority of my games, so that's where these articles will come from, I've been in that losing streak and mentality, and these are the things that helped me improve. 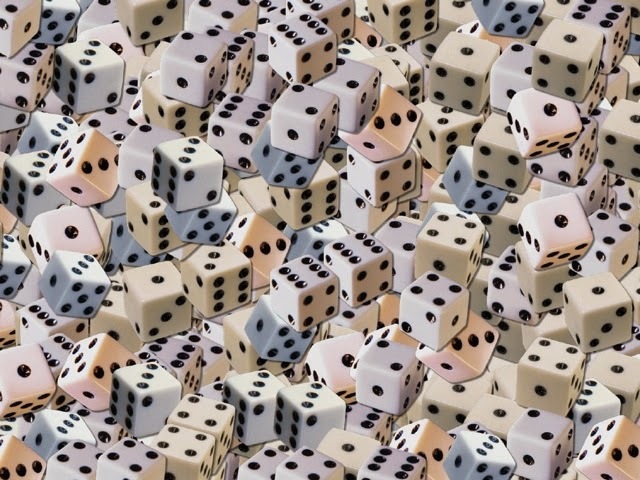 My first piece of advice therefore, and the focus of this post is about knowing your list. Sounds really basic, right? Well it is, but you'd be surprised how many people I've come across who come to a game and don't know their list. I don't just mean what units you have in it either, though it's not unheard of for an opponent to forget a model was included and never take it out of their bag. When I say know your list, what I really mean is understand your list - why have you taken the units you've included and what are they intending to achieve in any particular game. I mentioned that I had a four month losing streak when I got back into the game - there were some fundamental reasons behind that, and understanding army selection and unit selection was what cured it. 1. You need to understand the fundamental rules of the game and how they apply on the tabletop - recognising that the current edition of the rules places shooting in a stronger position than assault was a key thing for me, and also understanding how the cover mechanic worked (I've played plenty of games against guard who would simply duck behind their aegis line and get a 2+ save, then stand straight back up and fire normally in the next turn). 2. Second is understanding your own codex and it's strengths and weaknesses, and both veteran players and internet reviews can be hugely helpful in this regard. 3. Third, and the most relevant is understanding what each unit is capable of. I don't want to go into too much detail on the first point, I'd expect new players to make sure they learned the rules properly and to read around the subject to understand them - there are often subtle nuances to the wording that you don't get first time round. The second point is where this article really kicks in. 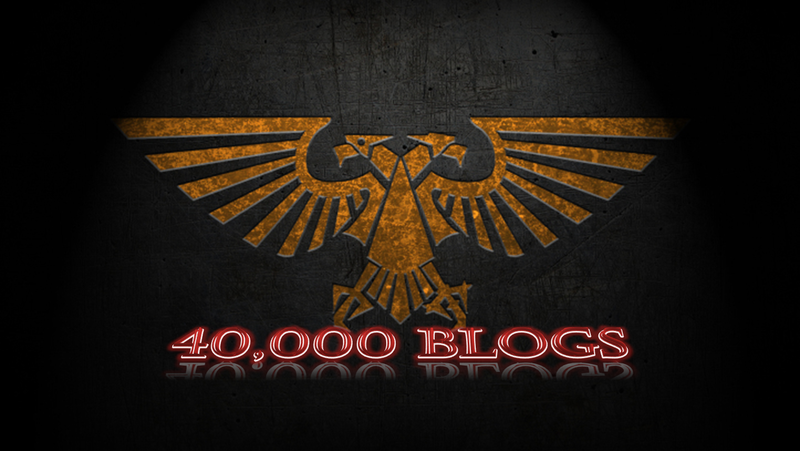 Understanding the strengths and weaknesses of the codex is crucial to both list building and in game tactics. When I went back to basics with my model collection with a view to revamping it for 6th edition, the first thing I did was to go through the entire book, listing whether a unit was intended for anti tank, anti infantry, anti air or anti elite infantry. This included looking at weapon upgrades and alternative loadouts so sometimes a unit would have more than one entry in my list. I then looked at the strengths of each individual unit and more importantly their weaknesses so I truly understood what everything brought to the table. What wins games? Objectives. So you need units that are capable of both holding them, and claiming them, and that needs different attributes. Holding objectives in your own half requires resilience, either from innate toughness, good armour or ability to utilise cover to it's greatest extent, and it also requires that those units can affect the game from those long distances. 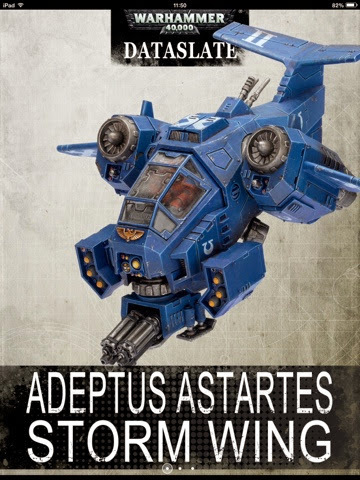 In my marine list, this tends to come from my centurion unit, armed with lascannons and missile launchers. They're tough, good save and long ranged. Their weaknesses are that they have no invulnerable save, and they can't fire overwatch, plus they really don't want to be in combat with much. By understanding those weaknesses I can plan for them, providing my centurions with a backup squad who can lay down some serious hurt on anything that does approach my lines with combat in mind. So that's home objectives taken care of, what about others? Well in terms of claiming them, troops units are best, since they get objective secured, and being fast enough to claim them early, or appear to not threaten them is key, so in came two bike squads and a bike mounted captain to make them troops. Bikes biggest weakness is their cost, though there's little you can do to ameliorate that besides taking cheaper units to fill out the roster or accepting that you'll be outnumbered. I'm not going to go through my whole lists but hopefully you've got the idea, by understanding the strengths and weaknesses of each individual unit you can have realistic expectations of what they'll achieve for you on the tabletop, and you can also identify what tasks they can achieve that you may not have planned for. So there you go. Understanding your list and why you take each unit is the first step on my path to becoming a better player. Welcome to terrain Tuesday - today is going to be a two-part post, with the first part dedicated to a review of the terrain I've bought recently, from Amera Plastic Mouldings. The second part will be a few pics of how I'm getting on with said terrain in terms of getting my modular table finished. 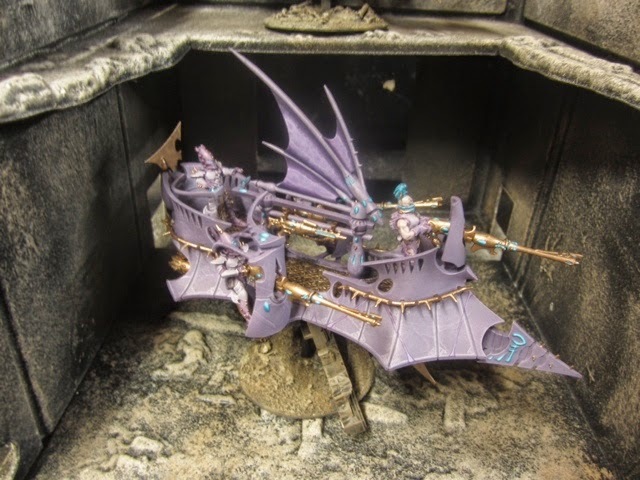 So on to the review then - Amera make scenery using vacuum moulds, which means for those of you that don't know, that the scenery is made from sucking hot plastic down onto a sculpted former. What that tends to result in though, is a piece of terrain that's actually more detailed on the underside than the side you view. As such the pieces can look 'soft' in comparison to the injection moulded style of terrain that GW use to create their pieces. 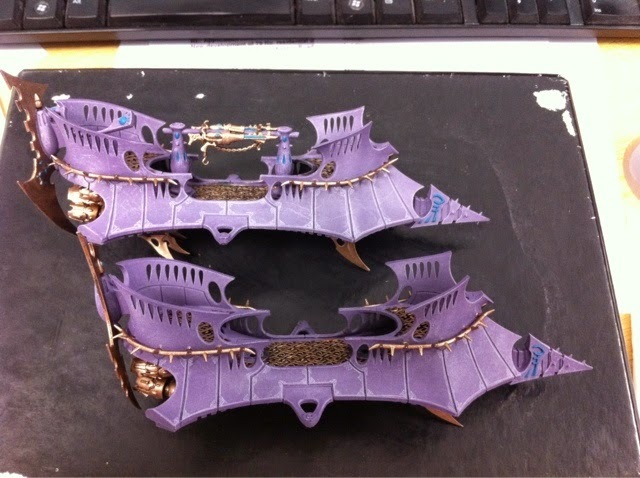 The counter to this, is that vacuum forming is considerably cheaper, meaning that I was able to get hold of enough scenery to fill an average board for about the same price as buying the Imperial Sector kit from Games Workshop. 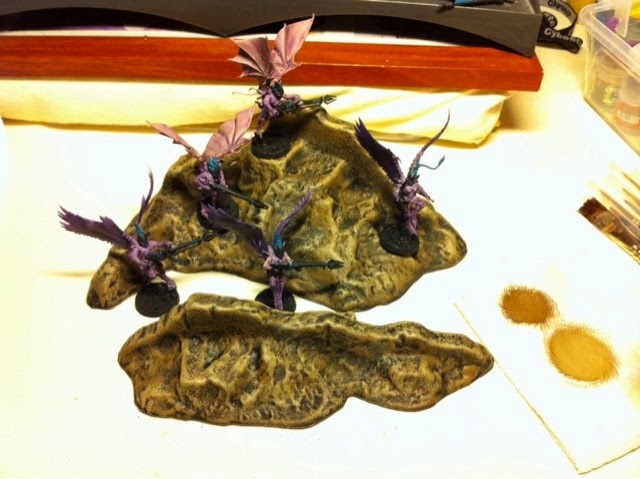 Their terrain pieces come in two types, single moulds and multi-part pieces. The single moulds cover things like trenches, demolished buildings, barricades etc, and the multi-part pieces are the more traditional buildings, some damaged and others whole. The single mould pieces are really nice, solid and easily cut from the surrounding plastic to make scatter terrain. I used scissors for simplicity, though a craft knife would be equally as good, if not better - just be careful the knife doesn't slip as it will score the plastic surface. The multi part kits are equally good quality, though generally require more work, as all the windows need cutting out and the wall will need sticking to each other and the base. I've found a two-part epoxy glue is best for this, tying the pieces together and leaving it to set overnight. I focused on the future zone range, though their fantasy range is equally extensive. How about painting it then? 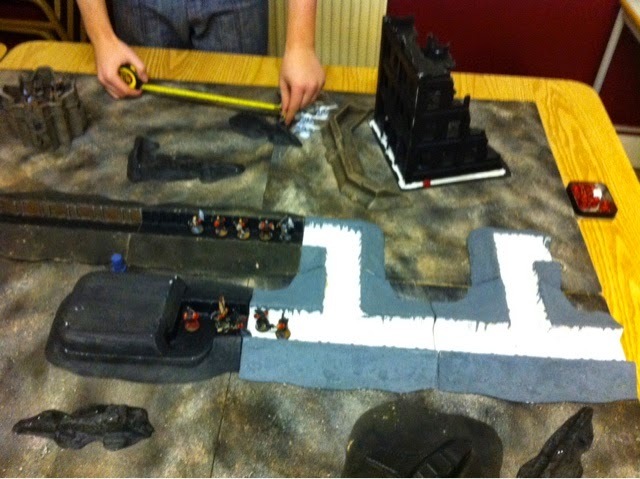 Well the terrain comes unaltered from the mould, so it's plain white plastic, and very smooth. 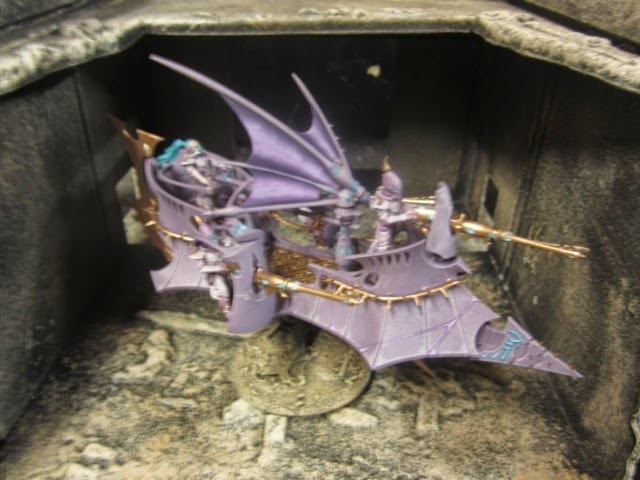 I've seen them detailed up pretty well just using that basic finish, but I think they work best when given a slightly more rough look (in fact, Amera have a tutorial on their site addressing how to paint their kits and this is how that article suggests it's done). Once assembled, I gave the models a blast with plastikote stone effect spray, and that will be black washed and then drybrushed up to match the bases on my miniatures. This gives a much more rugged appearance and one that I think looks fantastic on the battlefield. I'd give Amera Plastic Mouldings a 4.5 out of 5, the only half point reduction being because of the inevitable softness of the detail due to the moulding process. What about progress then, how's everything coming on? Hopefully these will have some paint on them by next week's post. 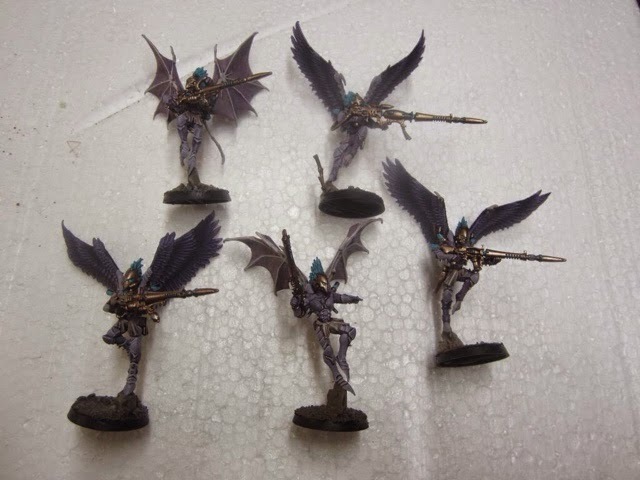 Greetings all, welcome to my weekly painting update, where I'm currently engrossed in the midst of preparing an all-conquering dark eldar raiding party to win me some spoils, and hopefully some friends, at blogwars 9 in June. I'm now two months into the project, so it's a good time to look back at what I was hoping to have achieved by now and how far along I am. 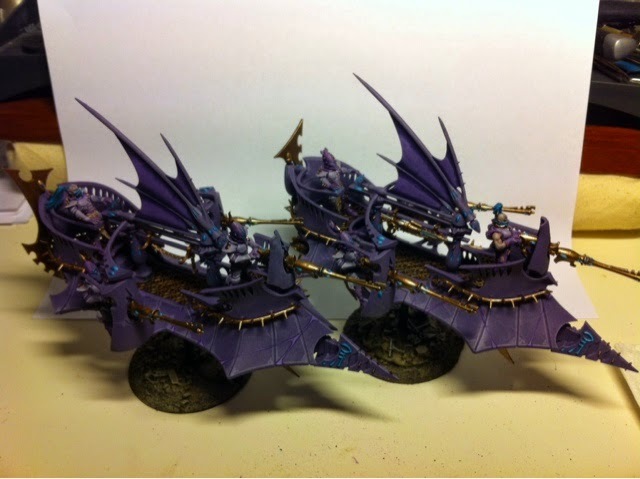 I'm pleased to say that's all complete, bar part of the razorwing' base, and I've also managed to finish up one of the scourge squads - you can see them above in an atmospheric photo, and below in a more detailed pic. I have to say that these models were a joy to paint, and I'm looking forward to finishing the second squad, also due this month. Before that though, there are more vehicles to be finished, and having done the first two raiders from my list, I figured where better to look than the similar ravager. Let's hope the old adage that painted models perform better because my dice rolls for them don't make comfortable reading. 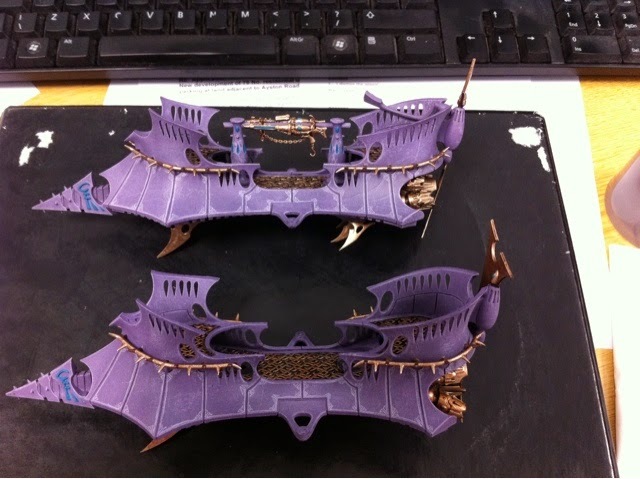 I started in properly on them last night, and so far I've done the base coats of purple and bronze, drybrushed the chassis and base coated and washed the gunners. The drybrushing on the sails is also complete. And I'm very keen to see how it performs on the tabletop. That's me done for now, tomorrow I'll have a terrain update and review! Hi all - here's a nice little weekend post for you all - a quick report on the three games I played last week. Now some of you may know my club is just starting an escalation campaign call the Desolation of Delta Tao (I gave a brief explanation of the concept here ). The first three games took place on Thursday night (well, one of the 750pt games is still to be played) and I'm pleased to say that yours truly is currently leading things (it won't last I'm sure). I'm running things in such a way that the overall winner will be the player who has accumulated the most Victory Points over the 7 games (we're thinking of adding an eighth game at the end just for fun - capture the squig, but I'll explain that when we get there). First game was a kill team where my bike squad (6 bikes and a multimelta attack bike) took on a 10 man chaos marine squad in a rhino in a game of head hunt (3vps for killing the enemy leader, 1 each for their specialists, first blood, linebreaker and for breaking them - causing 50% or more kills). It started well, with the rhino getting blown up on turn 1 by the attack bike. I followed that up though by only killing one model with the rest of my shooting (Dang power armour!). In response I lost two of my three specialists (one to overwatch fire from an ignores cover melta!) and I thought my number was up. Thankfully we got some combats going and the toughness of my bikers told in the end, I managed to kill the enemy leader and all three specialists, plus breaking my enemy and linebreaker to win the game 8-7. One of the interesting points of kill team here is that once you cause 50% casualties to your opponent, each model needs to take a break test at the start of each of their following turns, and if they fail it, they are removed from play. ATSKNF allows a re-roll to this, but this is a huge part of the game, because your opponent can really start running out of models quickly! Second game was against a footslogging wolf list with a nasty battle leader on thunderwolf, I used a pair of min sized tactical squads, with 1 plasma cannon, a level 1 librarian, a whirlwind, assault cannon razorback and an assault cannon/skyhammer storm talon. Having secured the starport territory after the first game i could modify all reserve rolls by one, but that didn't help my storm talon arrive when the die turned up with a '1'. 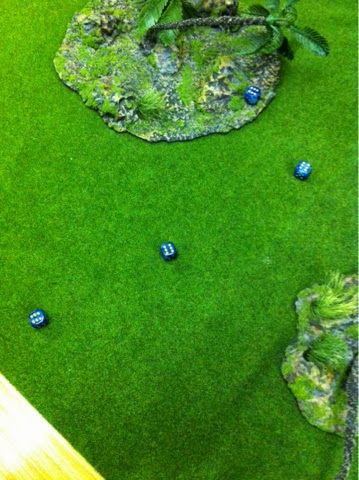 I rolled the dice anyway to see what damage he would have done and we're looking at 6 wounds on the battle leader! It was a very one-sided game and my opponent only had four models on the table at the end. Sadly one of them was holding an objective and the others were claiming linebreaker whilst my razorback was 1" short of holding another objective in his deployment zone. We both got slay the warlord and I held an objective in my opponent's deployment so we both had linebreaker. He got first blood. I made three massive mistakes here, the first was that i forgot to activate force and iron arm in my second turn, which (again, rolling in retropsect) meant my libby would have killed the battle leader outright. Second was not making sure that the razorback had the objective on turn 5 (i went round the terrain rather than through it, not wanting to risk immobilising myself). A third and possibly the most significant was shooting a combat squad at the solitary wolf guard instead of running over to the objective. I figured 8 bolter shots and a plasma cannon blast should take him down. It didn't. A 6-5 loss. It should also be noted though that my opponent had incredible bad luck with his plasma guns. He tried three shots in the game, all of which got hot, and two managed to kill their wielders! I even managed to destroy it with three of those results scoring glancing hits or higher! 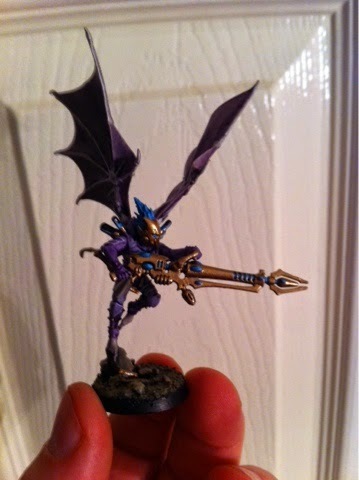 next up - 1000pts against a wraith list. My pre-written list is bikes - erm, help! At least I'll get jink saves against most of it!